I am sitting at home, a novelty indeed after five weeks which brought me from southeastern Siberia to Finland. It is now that I can sort through and edit my photos, regain some sleep reserves that I was lacking, revert to usual communications, and, so importantly, mentally process all that I have done. A fair amount happened in my small corner of the internet while I was largely ignoring it, or, as was the case for two weeks while in Siberia, unable to access it. While I was in the taiga camping, trail building, and having an amazing time with Great Baikal Trail, I was Freshly Pressed. As a result, I have loads of new followers who, if I am to be presumptuous, may want to hear a bit more about the person behind this blog. Coincidentally, while I was away, I was also kindly nominated by the sweet and funny collegelady17 for two blogging awards: the One Lovely Blog Award and the Very Inspiring Blogger Award. Well, it’s nice to be considered lovely and inspiring – thank you! Here I am to accept these awards and follow and break the rules as I see fit. You can tell from a quick google that I edited the rules to be, in my opinion, a bit less pressuring. Nominate 15 other amazing blogs. I have an excellent Gollum impression. This has been verified by many people, who I have proudly frightened. Speaking of Gollum – nerd alert! I love love love Tolkien and also Harry Potter. It would be embarrassing if I felt like being embarrassed, but honestly I’m just a bit proud. Despite that a high proportion of friends and family, and also my partner, are in various medical professions, I’m terribly squeamish. As in, reading about anatomy can make me feel disturbed. Nope, don’t like! I obsess over music, but do something quite interesting with it. When I get really hooked on a song, I add it to a special playlist. At the end of the year (or the semester, when I was still in school), I have a list of songs that I got into, in chronological order. I love going back and listening to those playlists. Most recent song of this type: ДДТ – Просвистела. I love love love sauna. Every time I do it, I love it more. 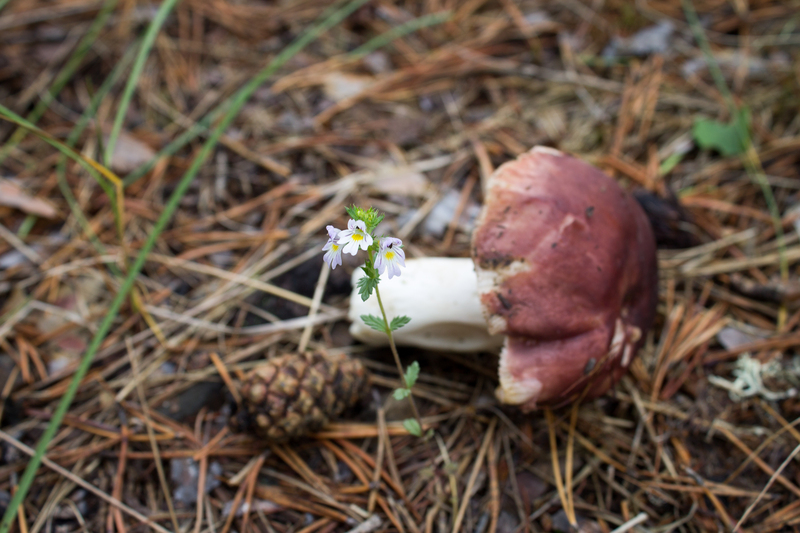 And as far as Finnish things go, I also discovered last week that I enjoy “mushrooming,” as we began calling hunting for mushrooms in English. One of my biggest hates is street harassment. I rarely participate in internet fights, but when I do, it is often about this. I’m not a tropical beach person. Or a tropical person, really. Though I’ll happily travel basically anywhere, I much prefer temperate or cold climates. And I like cold beaches more than hot ones! 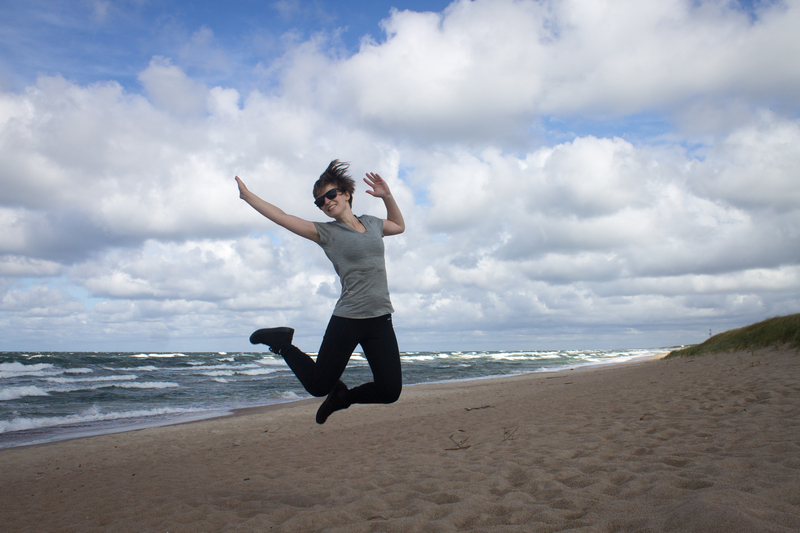 This is me, happily taking a corny jumping photo on a cold beach (the Curonian Spit in Lithuania). Here’s where I’ll simply list some blogs that I especially enjoy reading and basically always check out when a new post shows up on my reader. Consider this a blogroll. I’m not going to pressure anyone to accept this award and do a post though, though (it’s a chain award after all, and maybe not appealing to everyone). So, bloggers I like, feel free to do with this as you want, but know I enjoy your blogs! And to the bloggers I know personally – I miss you! And now I give up with the disclaimer that there are actually a lot of probably great blogs I found before I left on my trip – but I haven’t been able to keep up with them yet since I haven’t been online much! Without question I’ve overlooked some blogs I quite enjoy, but you know, next time. So. I leave you with these facts while the person behind them attempts to readjust to daily life at home. And starts purging clothes and other belongs in order to be lighter. And begins the job hunt. And, of course, creates new posts about her recent and incredible Siberian, Baltic, and Finnish adventures for your eyes and mind. Thank you, Tara! By the way, I have emailing you and Cheryl on my to do list, along with goodies such as laundry. Talk soon, I hope! Thank you so much for the nomination, Leah! <3 I really appreciate it! I accept the award of course! And will write on my blog the following week, also linking to you :) Again thanks! YES on #6! Thanks for being awesome! Thanks for the nomination – I’ve been so busy since I finished up I haven’t been near my blog but have some free time again this week so will get back to it. No worries – take your time! Huge congrats on finishing, once again!